So much pumpkin, so little time! This is a great little Autumn cookie; soft, with warm pumpkin spice flavor. My kids had the day off from school today - the perfect time for us to make some cookies together. We put up some Halloween decorations and were in the Fall mood. So, pumpkin cookies were a must. 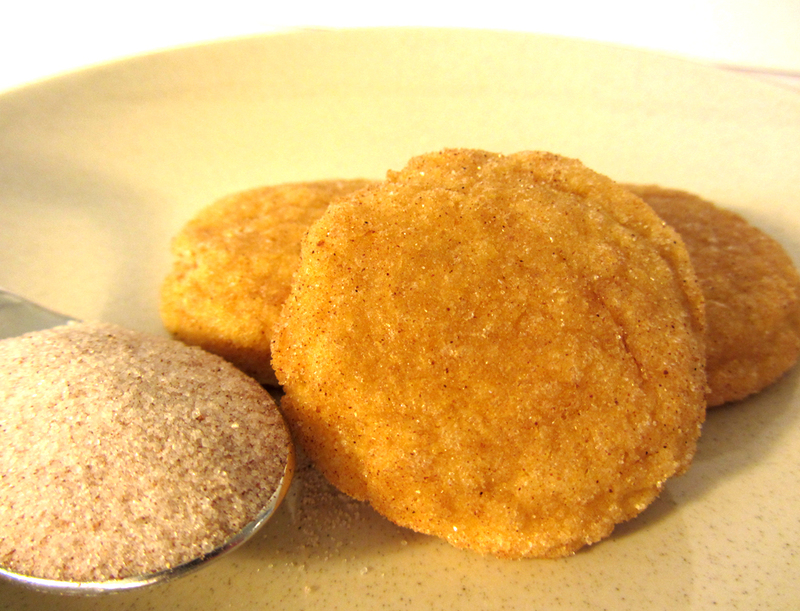 I chose these because snickerdoodles are super easy - a great fit for little helpers. This recipe is adapted from one at Annie's Eats. The kids had a great time measuring, stirring, scooping, coating, and squishing. And, the best part of course, tasting! The cookies came out just right. Pumpkinrific! 2. For the Coating: in a small bowl, stir together the sugar and spice. Set aside. 3. For the Cookies: in a medium bowl, whisk together the flour, baking powder, salt, and spice. Set aside. 4. Beat the butter in the bowl of a stand mixer until smooth. Add the sugars and beat until light and fluffy. 5. Beat the egg and vanilla into the butter mixture. Add the pumpkin and beat until well-blended (mixture may look separated at this point). 6. Add the dry ingredients. Mix on low until the dry ingredients are just incorporated. 7. Scoop tablespoonfuls of the dough into the sugar-spice mixture. Gently roll (or use a spoon) to coat. Place the dough onto the baking sheets, leaving 2" between each. 8. Dip the bottom of a drinking glass or meat pounder in the sugar-spice mixture (and redip between presses). Gently press each dough ball to flatten slightly. 9. Bake the cookies for about 7 minutes or until the edges are somewhat firm and the cookies are set (they will still look undercooked in the middle). 10. Allow the cookies to cool for 5 minutes on the sheets. Transfer to racks to cool completely.